Billionaire hedge fund guru Tom Steyer is preparing to leave the investment firm he founded in 1986, the New York Times reported Monday. Missing from the Times report, however, was any mention of Steyer’s deep financial and political ties to the Obama administration, as well any implication as to what the move may signify for Steyer's future. A Reuters piece of Steyer’s departure is more forthcoming, noting that "Democratic politics" is likely to play a role. Steyer’s firm, Farallon Capital Management, oversees nearly $20 billion in assets and ranks as one of the largest of its kind in the world. He has raised between $50,000 and $100,000 for President Barack Obama’s reelection campaign, and has personally donated at least $278,000 to Democratic campaigns and committees since 2007. 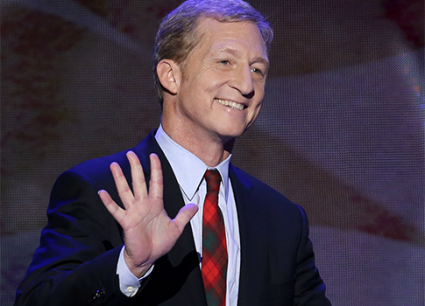 A hedge fund industry insider told the Washington Free Beacon that Steyer’s departure may indicate a forthcoming transition to politics, potentially as an adviser in a second Obama administration. "He's made a huge investment in the Obama administration and the Democratic party," the insider said. "It looks like he's getting ready to call in those chits if Obama wins a second term." Steyer said he planned to "focus full-time on giving back" in a letter to investors announcing his decision on Monday. "I want my life to revolve around service in one form or another," he wrote. A Farallon representative declined comment. Steyer was given a coveted speaking slot at the Democratic convention in Charlotte, N.C., last month, during which he praised Obama’s energy policies over the past four years. These policies have amounted to providing billions of dollars in taxpayer subsidies for green energy projects, dozens of which have failed or are currently experiencing financial difficulty. The president’s plan to "double down" on these controversial policies would directly benefit Steyer, who is reportedly one of the backers of Greener Capital, a prominent investment firm supporting green energy companies. Steyer’s firm owns more than $8 million in shares of Fuel Systems Solutions, which according to its website "designs, manufactures, and supplies proven, cost-effective alternative fuel components and systems for transportation and industrial applications. Its gaseous fuel technology for propane (LPG) and natural gas (CNG) generates savings, reduces emissions, and promotes energy independence." In his letter to investors, Steyer cited "encouraging the advanced energy economy" as something he planned to pursue in the near future. He has donated nearly $1.4 million to the Center for American Progress (CAP) since 2009 through his TomKat Charitable Trust. CAP is closely aligned with the Obama administration and is an avid supporter of the president’s green energy agenda. Steyer was listed as a director of the left-wing think tank as of 2010. Steyer and CAP founder John Podesta were leading voices in the successful effort to block expansion of the Keystone oil pipeline, which Obama has refused to authorize. They coauthored a Wall Street Journal op-ed in January 2012 that argued against the pipeline expansion and called for increased federal investment in green energy. However, Steyer knows to hedge his bets. His fund also owns millions of dollars worth of shares in Big Oil companies such as BP. Farallon also has substantial investments in foreign-owned companies, and operates a number of funds based in the Cayman Islands, the British dependency whose lax tax laws have made it a favorite target of Democrats. Steyer, whose net worth was an estimated $1.3 billion as of 2011, has enjoyed access to the White House. He has met with senior White House officials in the West Wing on at least four occasions, according to visitor logs. Such access is typical for prominent Obama fundraisers, a recent New York Times investigation found. Obama has a history of appointing top fundraisers and green energy investors to advise the White House on energy policy. California venture capitalist Steve Westly, who has raised more than $1.5 million for the president since 2007, currently sits on the Energy Advisory Board at the Department of Energy. Westly also addressed this year's Democratic National Convention in Charlotte. John Doerr, another prominent investor who has contributed more than $170,000 to Democratic campaigns and committees since 2008, was named to the president’s Economic Recovery Advisory Board, where he helped craft the controversial $787 billion stimulus package. Of the 27 companies listed in Doerr’s "green-tech" portfolio, 16 received some form of taxpayer support.